According to one authority, bitters appears to have originated in Germany in the seventeenth century, and then spread to Italy and England. In the latter country during George II’s reign (1727–1760), gin began to be regulated. It was taxed and the number of taverns was limited. As a consequence, “the gin sellers added various herbs to their product and sold it as a medicinal liquor (a ploy that has been used ever since in many countries whenever there have been attempts to control the distribution of spirits)” (Munsey 1970, 111). One such bitters has an interesting story. According to several popular sources, the cocktail was invented in the early nineteenth century in New Orleans by a Creole apothecary using bitters as an ingredient. The pharmacist was Antoine Amédéé Peychaud, whose history is murky—various sources say he arrived in New Orleans as early as 1795 or as late as 1824. However, he was apparently married there in 1811. He eventually opened his own “Pharmacie Peychaud” on Royal Street in what is today called the French Quarter. Figure 1. 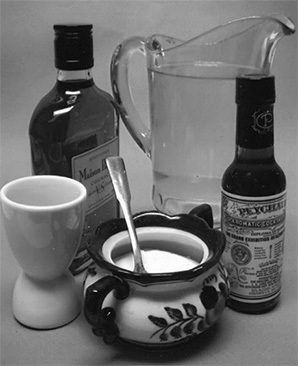 Peychaud’s “first” cocktail can still be made with these available ingredients (described in the text). Peychaud reportedly began to market his bitters in 1830. The rights to the product were purchased by Thomas H. Handy in the 1870s. Today Peychaud’s is used more or less exclusively as a flavoring in cocktails. Sweeter than another popular brand, Angostura Bitters, Peychaud’s is still made in Louisiana, a bright-red liquid sold in five-ounce bottles, its ingredients including gentian root (Peychaud’s Bitters 2014). Figure 2. Almanac advertising booklet for Hostetter’s Stomach Bitters. 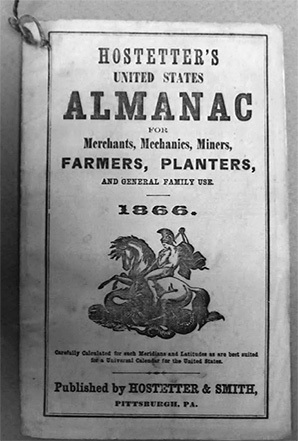 The product originated about 1852–1853 (the almanac says it has “been about fourteen years before the public” [p. 15]). In partnership with George W. Smith, David Hostetter of Pittsburgh began to manufacture a formula developed by his father, Dr. J. Hostetter. In its early form, Hostetter’s contained various amounts of alcohol—up to 47 percent (Fike 2006, 36). This consisted of “good Monongahela spirit,” i.e., “essence of rye,” indeed “Sound Rye,” which was “mixed with the juices of tonic and alterative roots, barks, and herbs” (p. 3). Hostetter and Smith claimed to have received “voluminous correspondence” from throughout the United States and South America, without a single expression of dissatisfaction. A few testimonials are included in the almanac. Generally, the users have endorsed the wide range of afflictions for which the bitters were said to be effective (pp. 3–21). In addition to those already mentioned, they included indigestion, flatulence, nausea, nighttime restlessness, palpitation of the heart, memory loss, depression, sour stomach, dimness of the eye, chills and fever, diaphragm pains, feebleness, nervousness, unsteady appetite, sudden spasms, nervous headaches, hysterics, bowel complaints, unease of pregnancy, and more—even hypochondria! So much was Hostetter’s a cure-all that it could replace “a whole medicine-chest full of tinctures, essences, powders and pills” (p. 10). And not only did it claim to cure but also to prevent the effects of poisoned air and water as an “unequaled tonic and disinfectant” and to provide “an absolute protection against intermittent and remittent fevers” and, indeed, “all epidemics” including malaria. It was also claimed to be an antidote to mercury poisoning, and (perhaps not surprisingly) “in cases where a morbid craving for alcohol has been generated,” the bitters “will be found an efficient means of allaying it”! Hostetter’s was always sold in bottles (these were embossed beginning in 1858); the proprietors decried “unscrupulous impostors” who “pretend to sell the article by the gallon or barrel” (p. 23). After Smith’s death in 1884, the enterprise became Hostetter & Co., still operated by the family. After passage of the 1906 Food and Drug Act, the alcohol content was lowered to 25 percent. During prohibition, the herbal content was increased to compensate for the loss of alcohol, but this produced an almost unbearable taste and consequently poor sales. The formula was restored after the repeal of prohibition, and it survived until 1958 (for its last four years known as Hostetter Tonic) (Fike 2006, 36). As shown by an advertisement on the back of the almanac (Clark & Barker, dealers in drugs, medicines, chemicals, etc., in Fredonia, New York), local drug or general stores were thereby identified as “agents for the sale of Hostetter’s Celebrated Stomach Bitters.” The almanacs may have been provided without cost to the agents in return for their ordering a certain amount of the product. 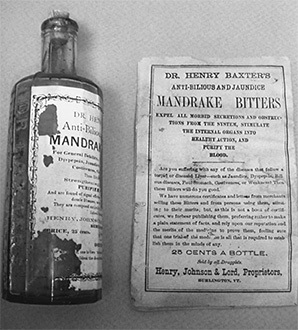 Advertised as early as 1881 was Dr. Henry Baxter’s Anti-Bilious and Jaundice Mandrake Bitters. An advertisement (Figure 3) promised to “expel all morbid secretions and obstructions from the system, stimulate the internal organs into healthy action, and purify the blood.” It asked, “Are you suffering with any of the diseases that follow a torpid or diseased Liver—such as Jaundice, Dyspepsia, Bilious diseases, Foul Stomach, Costiveness [constipation], or Weakness? Then these Bitters will do you good.” They sold for twenty-five cents per bottle. Also shown in Figure 2 is a twelve-paneled, aqua, embossed bottle with paper label dating from the later nineteenth century. It was manufactured by Henry, Johnson & Lord, Proprietors, Burlington, Vermont. Much later the product was sold by the Burlington Drug Co. (Fike 2006, 31). The name “Dr. Baxter’s Mandrake Bitters” suggests a possible ingredient. It was unlikely to contain the European Mandrake, but it could have included the so-called American Mandrake or Mayapple—once thought safe to use as a purgative but now known to be dangerous if taken internally (due to its cytoxic, or cell-killing, action) (Chevallier 1996, 250). Other bitters whose names suggested a main ingredient included California Fig & Herb, Curtis & Perkins Wild Cherry, Gilbert’s Sarsaparilla, Oregon Grape Root, Prickly Ash, Angostura Bark, Buhrer’s Gentian, Dr. Chandler’s Ginger Root, Dr. C.D. Warner’s German Hop, and Begg’s Dandelion Bitters (Fike 2006, 29–44; Kovel and Kovel 1979, 30–42). Analysis by government chemists acting under the 1906 Food and Drug Act (effective from the beginning of 1907) revealed the medically doubtful contents of many bitters concoctions. For instance, Hamburg Stomach Bitters was revealed to contain only “a sweetened water and alcoholic liquor flavored with a small amount of flavoring material and colored with caramel.” Kaufmann’s Sulfur Bitters did not contain an appreciable amount of sulfur as alleged, and its claims of treating diabetes and curing syphilis and leprosy were declared false and fraudulent. Proprietor Aaron P. Ordway was convicted and fined. Again, a Pale Orange Bitters of Cincinnati was found to be 32 percent alcohol colored with caramel; the defendant was fined. Yet again, a Pepsin Magen Bitters was revealed to contain only “an infinitesimal quantity of pepsin,” some sugar, and 28.44 percent alcohol. The Bettman–Johnson Company was fined accordingly. The list goes on (Nostrums and Quackery 1921, II: 748–754). Not only were the ingredients of most bitters unspecified (until the 1906 Food and Drug Act), but even popular herbal remedies could be harmful in certain cases. We have already looked at American Mandrake. For another example, wild black cherry bark—touted to relieve coughs, diarrhea, indigestion, and irritable bowel syndrome—is “highly toxic” if taken in excessive doses (Chevallier 1996, 255). Then there was alcohol, a common ingredient. Specified so were Clarke’s Sherry Wine Bitters, Greeley’s Bourbon Bitters, Doctor Gregory’s Scotch Bitters, and, among others, Tippecanoe, Chapin & Cone Sour Mash Bitters. Dr. Henley’s Wild Grape Root Bitters reportedly contained 52 percent alcohol in 1905. When the proprietor of Dr. Harter’s Wild Cherry Bitters died, his enterprising daughter married a whiskey manufacturer. Wholesale liquor dealers were themselves makers of some bitters, such as German Balsam Bitters of Oakland, California, and Hibernia Bitters of San Francisco. Concludes one source (Kovel and Kovel 1979, 30), bitters “was often of such high alcohol content that the user felt healthier with each sip.” Still the proprietors of Brown’s Iron Bitters insisted theirs was “A Valuable Family Medicine. Not a substitute for whiskey. Not sold as a beverage. Not composed mostly of spirits. Not sold in bar-rooms.” Some bitters, like Dr. Webb’s, succumbed to prohibition (Fike 2006, 29–44). The American Medical Association, in its Nostrums and Quackery (1921, 7–40), cited Hostetter’s Stomach Bitters (discussed earlier), noting that its contents were 25 percent alcohol or half the strength of straight whiskey. If one took the daily dose of six tablespoons of Hostetter’s, one would drink the equivalent of nearly two bottles of beer or one-and-a-half shots of whiskey. Needless to say, alcohol could exacerbate some conditions. And who today would think it suitable for a pregnant woman to take—especially in unregulated amounts? Nor was alcohol the most outrageous ingredient of some bitters. Patent medicines of the day sometimes contained cocaine, among them a product sold by J.F. Miller of Chicago (under the name R.W. Davis Drug Company). This was called Cocainized Pepsin Cinchona Bitters. Not only did it lack pepsin, but it contained cocaine and cocaine derivatives without mention of that fact on the label. The amount of alcohol contained was also incorrectly stated, and the company made “false and misleading” claims that it would purify the blood and act speedily as a remedy for a host of ailments. It was analyzed by government chemists, declared misbranded, and—following an entered plea of guilty—Miller was fined (Nostrums and Quackery 1912, I: 551). Bitters bottles are highly collectible. They exist in a great variety of shapes—typically flat front and back (i.e., having a rectangular base), but also cylindrical, multi-paneled (e.g., twelve-sided for Atwood’s Jaundice Bitters), and artistic forms, including figures like barrels (especially for those containing bourbon whiskey), a lady’s leg, even (for example, for American Life Bitters of Omaha) a log-cabin shape. They are found as well in various colors of glass: clear, aqua, green, differing hues of amber, light blue, cobalt, amethyst, and (very rarely) red, among others. Due to such variety, experts caution, “The word bitters must be embossed on the glass or a paper label must be affixed for the collector to call the bottle a bitters bottle” (Kovel and Kovel 1979, 30–31). Bitters bottles are a window into an earlier era of quackery (although sometimes perhaps well-intentioned), as well as into the related worlds of unbridled advertising, liquor sales and consumption, and, of course, the very human need for relief from myriad ailments. Bitters may sometimes have alleviated these, but more often only pretended to—no doubt sometimes causing actual harm, perhaps especially to the untold unborn. 1. The Oxford English Dictionary (OED) (1971) says cocktail is a slang American term of lost origin, known from as early as 1809. At issue is the definition of the word, the OED describing it as “consisting of spirit mixed with a small quantity of bitters, some sugar, etc.” However, the word has come to mean any mixed drink of distilled spirits and would include juleps, which are centuries older than Peychaud’s cocktail (Nickell 2003, 4–6). Chevallier, Andrew. 1996. The Encyclopedia of Medicinal Plants. New York: D.K. Publishing. Downs, Tom, and John T. Edge. 2000. New Orleans. London: Lonely Planet Publications. Fike, Richard E. 2006. The Bottle Book: A Comprehensive Guide to Historic, Embossed Medicine Bottles. Caldwell, NJ: The Blackburn Press. Hostetter’s United States Almanac. . . . 1866. Pittsburgh, PA: Hostetter & Smith. Johnson, Samuel. 1755. A Dictionary of The English Language. Abridged from an edition of 1756; reprinted New York: Barnes & Noble. Kovel, Ralph, and Terry Kovel. 1979. The Kovels’ Complete Bottle Price List. New York: Crown Publishers. Munsey, Cecil. 1970. The Illustrated Guide to Collecting Bottles. New York: W.W. Norton & Company. Nickell, Joe. 2003. The Kentucky Mint Julep. Lexington: University Press of Kentucky. Nostrums and Quackery. 1912, 1921. Second ed. ; vols. I, II; Chicago: American Medical Association Press. Oxford English Dictionary, The Compact Edition of. 1971. New York: Oxford University Press. Peychaud’s Bitters. 2014. Online at www.cooksinfo.com/peychauds-bitters; accessed December 4, 2014. Webster, Noah. 1849. An American Dictionary of the English Language. Revised and Enlarged by Chauncey A. Goodrich. Springfield, Mass: George and Charles Merriam.